Britain’s financial institutions must put concrete plans in place over the next few months to deal with the growing threat of cyber-attacks, the Bank of England has warned. Minutes of last month’s BofE Financial Policy Committee meeting reveal concerns that, with the cyber-threat growing, the financial system has “a number of potential vulnerabilities, reflecting its high degree of interconnectedness, its reliance on centralised market infrastructure, and its sometimes complex legacy IT systems”. The Treasury is already working to assess, test and improve the UK’s financial system’s resilience to cyber-attacks, developing general guidance on best practice for banks. The FPC has backed the “direction of travel” but says that the next step is for regulators to make sure that banks have concrete plans in place. Action plans should be ready by the first quarter of 2014, with progress report by the end of this year. The Bank of England will also “be reviewing its own resilience”. Last month a top US banking regulator warned that more legislation may be needed in the fight against an ever-growing cyber-security threat which has seen bank Web sites come under repeated DDoS attacks in recent months. To find out how best to draw up plans for these regulations, register for the Ovum and Incapsula webinar Effectively mitigating the largest and smartest DDoS attacks here. No one doubts that social media is a valuable tool for business. Unfortunately it is now a top asset for cyber-criminals too, playing a pivotal role in the way in which they reach their targets. Initially seen as a rich source for gathering the intelligence required for more sophisticated attacks, nowadays attackers are using the psychology behind social media to gain and exploit users’ trust. A single attack can influence the actions of millions of people in real-time as shown when a compromised trusted account sent out false information about explosions at the White House causing a “flash crash” of the US stock market. If a Twitter account with millions of followers sends a link to an infected site the odds of some of those recipients clicking on the link are greatly increased. By compromising a central site and using it to serve malware attackers are able to reach more technically savvy victims who might not be fooled by phishing attempts. The only effective defence is awareness and education to understand the latest security risks and stay ahead of emerging threats. Join the IBM experts at Ovum Identity & Access Management on 22nd October to find out what you can do to help keep your organization secure. 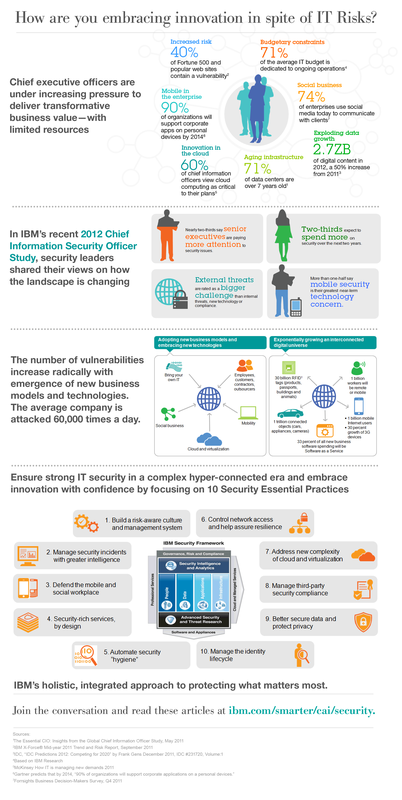 Infographic: How are you embracing innovation in spite of IT risks? The line between work and personal technology continues to merge as smartphones, tablets and other mobile devices proliferate. Although mobile employees can be more productive by working anytime and anywhere, doing so means they are accessing resources from outside the traditional network perimeter. Traditional access and authentication controls are now no longer sufficient to safeguard the organisation. As cyber criminals become more sophisticated in their attack methods, so organisations need to be more diligent and proactive in protecting resources in a mobile environment. IBM has developed a portfolio of mobile security solutions that emphasize an adaptive approach to security that can help drive down costs, is secure and can keep up with today’s business climate. ISAM for Mobile protects access to enterprise resources by authenticating and authorizing mobile users and their devices. Available as either a virtual or hardware based appliance, ISAM for Mobile enables organisations to safeguard access points into the corporate network and enforce context-based access policies that define who and what can access protected resources. Highly scalable and configurable, the solution is designed to deliver a quick time to value and a lower total cost of ownership (TCO). Enables secure user access to mobile and web applications with single sign-on, session management and context-based access control. Improves identity assurance with flexible authentication schemes, such as one-time passwords and RSA SecurID token support ensure single sign-on is available from all access points in the network. Enforces context-aware authorization using device fingerprinting, geographic location awareness and IP reputation scores. To learn more about protecting the organisation in a multi-perimeter world, come and hear Ravi Srinivasan, Director, Strategy and Product Management, IBM Security Systems, present on Threat-aware Identity and Access Management during the keynote at Ovum Identity & Access Management on 22nd October.